Say "Hello again" to relegation! When the DEL was founded in 1994, EVERYTHING was as it ought to be. Modeled on the National Hockey League, the selections of the clubs had been transformed into corporate entities, most teams had been named after animals (making instant recognition easier) and the threat by relegation had been abolished. In the last few years, more and more DEL and DEB officials saw the necessity to REALLY revive the relegation format. And during the first days of the 2001-2 season, the league and the association officials made an agreement about aconnection of DEL and 2nd Bundesliga, which contents: 1. The two worst teams of the DEL will play "play-downs", held in a best-of series (the number of games has not yet been decided as of this writing). 2. The loser of these games will be replaced by the champion of the 2nd Bundesliga. Sounds quite simple, right? It isn't. The promoted team has to buy the relegated team's shares in DEL ltd., while the promoted team has to spend a part of these receipts to buy the promoted team's shares of the corporation which organizes the 2nd Bundesliga. Add to that a much bigger problem; the promoted team has to have a stadium with an attendance capacity of 4000 or more (or has to be able to expand to capacity before the 2002-3 season starts). Many top teams of the 2nd Bundesliga don't have such a capacity. That includes Bremerhaven (only 2050), Heilbronn (2000), Ingolstadt (3741) and Wolfsburg (2700). Under the rules that have been set up, if the champion cannot meet these requirements, the runner-up can take his place. According to this setup, if, for example, Bremerhaven would reach the finals against SC Riessersee (with a capacity of 8000 in the Olympic stadium of Garmisch-Partenkirchen), there really would be nothing to play for (except for the dubious "honor" of having won a meaningless game). There is yet another problem on the DEL horizon. The Revier Löwen Oberhausen, who are already playing in the DEL, have a big stadium, but no one knows for how long. At the moment, they pay about 250,000 Euros each season to rent the stadium but as Günter Engel, the team's secretary, says, "that's only half of the story." The Löwen don't receive a share of the receipts earned through food and drink concessions at the arena and do not have many opportunities to get revenue by selling advertising space to their sponsors. The result, according to Engel: "We lose another 250,000 Euros". The Frankfurt Lions and the Düsseldorfer EG have problems of another kind; the on-ice variety. Both are losing teams. The Frankfurt Lions could win only one of the first eight games - then they fired headcoach Blair J. MacDonald. His former assistant Doug Bradley was named the interim successor and led the team to a victory over the Mannheim Adler by a 2-0 score on October 3rd (the German national holiday). But after losing at Kassel (2:5) and against Schwenningen (1:3) the following weekend, the Lions were also on the lookout for new players. Now they've signed Christoph Sandner (born in Landsberg, played for Augsburg last winter) and Robert Francz (born in Bad Muskau, played for the Mississippi Wolves and the Springfield Falcons in 2000-1). Also on October 3rd, Düsseldorf lost 2-4 against Moskitos Essen. After the match, DEG coach Gerhard Brunner felt that it was time to quit his job and a barter was made. Brunner became "coordinator of sports matters" (whatever that nebulous title means) and Michael Komma, who had held this position before, became headcoach. Now HE's trying to get along with a team of which he'd just said, "Many of these players are not professionals." By that, he did definitely not mean that they do not earn a lot of money! One positive surprise of the early 2001-2 season has been the play of the Augsburger Panther, who have earned 26 points (of 36 possible) in the first 12 games - with a team that wasn't even expected to reach the play-offs - and even enthroned on range one. The team consists of "good old" players (known as the the "Russian line" with Sergei Vostrikov, Igor Maskennikov and Vassili Pankov), as well as young players like Eric Dylla or Andreas Morczinietz. But let us see how long this high-altitude flight is going to last... it's a long season. "Too much is too much! ", many people in Frankfurt may have thought on January 2nd, after the defeat of the Lions against Nürnberg (1-2, with goals by Martin Jiranek and Mario Chitaroni, after Jason Ruff had made the Lions take the lead in the game). Two days after, coach Peter Obresa got fired, team manager Ricki Alexander (who had made up most parts of the squad) asked for annulment of his contract at the end of the month. The new coach is Blair McDonald, who as a player lead the Edmonton Oilers into the Stanley Cup finals in 1981. He is already also busy with finding the last foreign player the Lions may sign with this season. There are rumours in the air about Zarley Zalapski, Marty McSorley - and even Paul Coffey!! Whoever it will be, he will have to try hard to get the team into the play offs somehow, 'cause the leeway to place eight already contains fifteen points. For the Hannover Scorpions, a leeway of eight points even seemed to be big enough to send their coach into the wilderness - again. Kevin Gaudet had already been fired the year before, when he became the predecessor and (later on, of course...) successor of Curt Lundström. But by the time of writing, it was not yet clear who is going to pick up Gaudet's job now. As I already hinted in my last article (in November), Berlin Capitals coach Michael Komma became a victim of conspiracy and lost his job. Just a few hours before the game against the Eisbären in mid-November. That shows that Roger Wittmann, the man in the background, is quite an expert in dramaturgy. But Komma was an expert in hockey! The new coach of the Caps, Chris Valentine, also is; in his first three games, the his team got seven points (3-1 against Munich, 5-6 after shoot-out against the Eisbären and 6-2 against Frankfurt) - and reached the league leadership again (which also shows that Komma's work was not bad). But in December, the leadership changed a few times - till around X-Mas,, the Munich Barons climbed on first place (in spite of the injuries of Chris Luongo, Heiko Smazal, Bob Sweeney, Peter Douris and Mike Kennedy). Meanwhile the have a margin of seven points to the team on the second place. One of the most successful scorers in the team is Robert Hock. He already played for Rosenheim, Cologne, Riessersee and Heilbronn (in the 2nd Bundesliga), but is now far better than ever. Due to this fact, during a game against Kassel there was a big banner in the CentrO, saying: "Löwen fans wonder: is Zach blind or why does Hock not play for Germany?" After the match, Zach was asked by a reporter: "A word about Hock?" - "Two words", Zach answered: "Very good." Will Hock get a chance at the qualification tournament for the Olympic Games in February? Zach only knows. Essen's coach Jan Benda senior seemingly did not know anymore how to get along with his job. "For quite a long time now we're really going thru a bad crisis, that's why it all is not surprising to me. (...) What I saw was, that the fans constantly made the teem feel insecure by chanting against me. The I saw that there's no other way. I just had to get away from the boards, the boys finally must be left in peace again." After the game against the Eisbären (2:4), Benda resigned. Essen's new coach, Mike Zettel, is only the second coach in the history of the club. After the bankruptcy of the EHC Essen-West in 1994, Benda became coach of the new club ESC Moskitos Essen, in the beginning even working in an honorary capacity. "Essen's hockey gave me so much in my time as a player. I simply was in duty to give something back. ", he once said about this. In the year 2000, people in Germany found out that there are also other people for which it would be better to give something back: cash!!! And it is not only the former German Federal Chancellor Helmut Kohl and his CDU party who evaded taxes. Not quite as diligent as Mr Kohl, but with quite the same tactics, the Düsseldorfer EG worked for a few years. It would go beyond the scope of an article like this to tell every detail of the story, but it is proved that between 1990 and 1998 the DEG did not pay tax on every sold ticket, opened "black accounts" (as they are called in Germany, suitable to the colour of Mr Kohl's political party) and often gave an extra bonus to some players by that money, also without paying taxes on it. Differently from Kohl, DEG's former president Josef Klüh is remorseful now: "It all must come to light. I bear the responsibility and will settle all pay dues." He denounced himself to the police, not to be arrested. Now there are rumours that "70 percent of the clubs" have these so-called "black accounts", but there have no investigations on that matters been done yet. The Augsburger Panther, already having said goodbye to every hope to reach the play offs, is getting in financial troubles. "Yet the breaking off of the negotiations concerning the advertising on the ice rink is a hard setback causing a gap of 130000 or 140000 German marks in our budget." At the moment, there's no struggle for existence for the Panthers, but Karl-Heinz Fliegauf's forecast ain't very bright: "As a small club, we'll always have to fight big problems. In the upcoming season, we'll just have to economize even more, spending even less money on the staff." But with less money, the prospects to reach the play offs would be even worse, so they would again have to economize more etc, etc, etc... It is a vicious circle. In times of decreasing average attendance, the search for a solution is like the quest for the Holy Graal. But King Arthur and his Knights of the Round Table are no DEL team managers. Therefore, the clubs have to help themselves. Now some managers, e.g. Düsseldorfs's Ben Zamek suggest a play down round, but not to determinbe a club to be relegated to the 2nd Bundesliga. It is a mystery to every clear-thinking fellow: partially the same persons mourning that sixty games are far too much for an interesting regular season now want even more games afterwards..... but if the fans don't attend the matches now, why should they be doing so then, when the eight worst team of the league would definitely only be playing for the "golden pineapple"? Another recommendation came from Munich Barons manager Max Fedra. "We simply have too much games, so a division of the league into two groups would be a useful alternative.... a division of the DEL into a Western group with Hannover, Kassel, Oberhausen, Cologne, Iserlohn, Essen, Düsseldorf and Krefeld and a Southern/Eastern group with the two Berlin clubs, Mannheim, Munich, Augsburg, Schwenningen, Nürnberg and Frankfurt." Playing four times against each time of the own group and twice against the others is Fedra's idea for a mode. For a decision like this, a two-thirds majority at the assembly of companions would be necessary. Meanwhile the ERC Ingolstadt (so far playing in the 2nd Bundesliga) has decided to be willing to join the DEL in the 2001-2 season. Sepp Lehner, manager of the "Ingolstadt Panther GmbH", stated on November 24th: "If we meet the sporty requirements, we want to be promoted; and provided that we reach first place, we'll apply for integration within the DEL." About buying the license of a team with financial problems he only said that it would be possible, but no negotiations with any troubled team have yet come up. Patrik Augusta (Schwenningen): He scored more goals than anyone else in his team (16), and only the Ukrainian Vadim Slivchenko (36) has more scoring points than him (31). Pavel Cagas (Hannover): Not too good, not too bad, but the number one goalie of his team. Peter Gulda (Oberhausen): He plays in the second line, he has the second-most scoring points of all Revier Loewen defenders, and he is wearing the jersey with #2. Karel Lang (Krefeld): played only 17 games yet, but his goal against average (2.54) is better that the one of his teammate Roger Nordström - and the ninth-best in the whole DEL league! Tomas Martinec (Iserlohn): plays in the first line, together with Leonids Tambijevs and Alexander Kuzminski - and he's the best thede three. And the youngest! Roman Meluzin (Essen): "I did not play here the way I can. Ice-hockey in Germany is not to my liking." His contract got annulled on January 8th. Jan Nemecek (Nürnberg): His way of playing is not very conspicious, but makes him be one of the best in his team, together with goalie Paris Duffus and the Belarussian forward Dmitri Dudik. Martin Sychra (Essen): could not play for a long time, due to an injury at his hand, but now he's fine again. Radek Toth (Iserlohn): still does not play very often, for Duane Derksen does his job very well. Jiri Veber (Schwenningen): not outstanding, but reliable. (20-11-00 Jack Barron) Che explains why, after Augsburg's Bob Manno, Berlin Capitals' coach Michael Komma has also been dismissed (his successor is Chris Valentine). Hockey tradition has it that coaches get fired when matches get lost. Many matches. An unbearable number of matches. But if a successful club wants to get rid of its coach, they have to find another "reason" for it. The Berlin Capitals were leading the DEL table when the intrigue about coach Michael Komma started. In several interviews, he said that he lacked "the bosses' faith in my work" and he noticed "how the players are whispering about me behind my back." 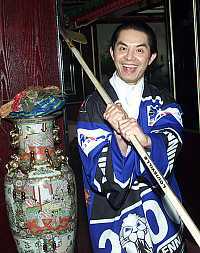 This year, his contract was renewed only because he had lead the Caps into the 2000 play-off semi-finals. Now, he didn't want to wait such a long time again to know his fate. Komma's old friend, Hans Zach, (coach of the Kassel Huskies and the German national team) thought that he had found the reason for it: Capitals manager Rob Cimetta (former player of the Capitals and the Mannheim Adler). He said, "North Americans like him have no business to be here. As a player, he was already soft, crafty, invisible. A coward, actually. Now he goes on like this!" Komma has decided to leave the Capitals (at the latest) after the 2000-01 season. But it's a poorly kept secret that he'll leave Berlin earlier than that. Another coach indirectly got fired by his team. Augsburg's Bob Manno lost his job on Saturday, the 21st of October. The evening before the Panthers had lost 0-10 in Munich and received the worst defeat in their (up to then) 647 games in the highest German league. Manager Lothar Sigl called it a "plebiscite", when 20 players of Augsburg refused anything which could have prevented or lessened the defeat. After the game, some Panthers fans made sit-down strike in front of the team bus - and the players made clear that with Manno, they'll have no problem losing all of the following 46 games. So Sigl had no choice. Now Manno's former assistant, Danny Naud, ist the new headcoach. But meanwhile, forward Håkan Åhlund declared his solidarity with Manno and left Augsburg. The Panthers, on bottom of the table, seemingly won't let go of any other players. Sigl: "We won't give away this season, but try to be successful with decency and fairness instead." The Capitals have lost their leadership of the table, as well as (before and afterwards) Nürnberg, Krefeld, Hannover, Mannheim, Köln and Munich. The top-eight teams are mixed around every day, Frankfurt (in the #9 sport), is watching out for an opportunity. On bottom of the table, Augsburg, the Schwenningen Wild Wings and Eisbären Berlin are in biggest trouble. But the Eisbären have now signed with 38-years-old John Chabot (former Frankfurt Lion and Berlin Capital)! Iserlohn (14th place) is not as bad as many supposed it to be. Oberhausen and Essen, far better than last winter, are in spots 10 and 11 - even though the Moskito's Esa Tikkanen still doesn't seem to be the same as he was during the World Championship in St.Petersburg. Patrik Augusta (Schwenningen): plays in the Wild Wings' 3rd line, but is the 6th best scorer of the team. Pavel Cagas (Hannover): Seemingly no more problems with his back. He can play again - and not badly at all! Peter Gulda (Oberhausen): He and Jesper Damgaard are the outstanding players of the Revier Löwen at the moment. Both are leading in the plus-minus-statistics of the team. Karel Lang (Krefeld): By way of exception, he played against Augsburg, when Krefeld won 5-1. Due to this result, the team climbed the top of the table for the first time since December 21, 1977! Tomas Martinec (Iserlohn): With 10 goals, he has scored more goals than any other player of his team - there are only 5 DEL players who have scored more goals than him! Roman Meluzin (Essen): 10 points in 20 games. Not really bad, but not as much as many expected from him. Jan Nemecek (Nürnberg): Didn't start well into the season, but is getting better and better every day. Martin Sychra (Essen): 13 points in 20 games..... better than Meluzin! Radek Toth (Iserlohn): is playing more often than before, but is still only goalie #2 behind Duane Derksen. (08-09-00 ada) DEL will have even number of teams finally! That is first good news. The other is all the hockey fans will have a chance to see the legend of all legends - Esa Tikkanen. He played already in World Championship in 1984, would you believe it? I would like to see Johnny Walker in action. If he is as good as the famous drink he must be really a corner-stone of Frankfurt Lions. The whole Libya will support the newby Iserlohn Roosters . Why? Che will tell you in the following article... German league starts today. Great events cast their shadows. So, too, does the 2000-1 DEL season, which will be inaugurated on September 8th, when sixteen teams step on ice to aim for fame once more. As with every year, the overriding question is who is going to win the championship this time? And just like every year, the reigning champion is one of the most-nominated favorites; a Jolly good idea, because the Munich Barons still have a great squad, although they would rather trust in player quality than in quantity (eight players have left the club, only five new players were signed). Runner-up Cologne is also expected to be successful, having armed themselves with titans like Liam Garvey (Nürnberg), André Faust (Augsburg), Dave McLlwain (SC Bern, Switzerland) and Dieter Kalt (Klagenfurter AC, Austria). The Mannheim Adler will also have a say in the fight for the championship if their new aces, Devin Edgerton (who came from Frankfurt) or Jean-Francois Jomphe will score as frequently as they did for their old clubs. Jomphe's former teammates, the Krefeld Pinguine, e.g. with their new duo of defenders Marc Hussey and Claudio Scremin (from the British champion London nights), are also predicted to play a leading role in the up-coming season. Some fans bet on the Nürnberg IceTigers, who at least recruited Swedish national team's defender Björn Nord (late of Djurgarden Stockholm) and forward Luciano Borsato (former player of HC Davos, IFK Helsinki, Cologne and the Winnipeg Jets). On the bottom of the table, the situation is quite as unclear as on the top. In Essen, only five players (Vollmer, Savard, Appel, Sychra and Verwey) have "survived" the disastrous past season - all others have been sent off into the wilderness and replaced by 22 new Moskitos, most notably, Esa Tikkanen (he of 1063 NHL games for Edmonton, St.Louis, New Jersey, Vancouver, Florida, Washington and the NY Rangers). The second worst team of 1999-2000, the Revier Löwen from Oberhausen, also fired 14 players and hired 15 new ones, of which the most famous are Jesper Damgaard (Malmö Red Hawks, Sweden), Leif Carlsson (Eisbären), Andrei Kovalev (Krefeld) and Peter Draisaitl (Essen). In addition, they are the only DEL team without any players from North America. Two new teams have entered the DEL this year: the Düsseldorfer EG (which won four championships in a row 1990-3), reigning champion of the 2nd Bundesliga, and the Iserlohn Roosters (famous in 1987 for advertising the so-called "Green Book" of Muammar al Gaddafi, leader of the Libyan Revolution), who simply bought the licence of the financially struggled Star Bulls Rosenheim. But while the Roosters have a very low-budget team, the DEG is demanding - but who in the DEL would not do so if he had a goalie like Andrei Trefilov (the ex-Buffalo Sabre and Calgary Flame who took part in the Olympic Games '92 in Albertville and '98 in Nagano)? Another team which could be successful are the Frankfurt Lions. On the one hand, they lost not only the legendary John Chabot to retirement, but also Chris Snell (to the Hannover Scorpions) and Andrei Vasiiev. On the other hand, during the training camp in Karlovy Vary (Czech Republic), they knew how to convince with their new mixture of olf stars like Johnny Walker (who doesn't share in the whiskey of the same name) or Greg Evtushevski (former German national player) and youngsters as Leonardo Conti, Marek Sebek and Philip Schumacher. Patrice Lefebvre, who came from Mannheim (together with Schumacher), will be part of a glorious reunion: in 96-97, he and his new teammates Ken Quinney and Martin Gendron scored 257 points for Las Vegas Thunder in the IHL. Of strong interest is the situation in Berlin. Both teams have problems with the city's senate, concerning the availability of their ice rinks. On ice, things are a bit different. But while the Capitals have only changed a few players, the Eisbären substituted many parts of their team; their best-known new face is goalie Klaus Merk, who played many years for the Berlin Capitals. Odd.... one year after the Finnn, Niklas Hede, broke the taboo of going from one Berlin team to the other, there are at least three former Eisbören in the Capitals' team (Udo Döhler, Thomas Sjögren, Yvon Corriveau) and two former Capitals in the Eisbären squad (Merk and Jeff Tomlinson). For the first time since 96-97, there is a limitation of foreign players in the DEL. Each club may "only" sign with 16 players of other nationalities than German (next season, the number will be reduced to 14 players). There are no restrictions of the number of German players. In addition, each club has to equip three young German players (younger than 23 years) with so-called "promotion licences", which authorize them to play for the DEL team and a club of a lower league, and to commute between those two teams without limitation. Each DEL team will face any other four times, the 60th (and last) day of the regular season will be March 18th 2001. The play-offs will start five days later, and at the latest, the new German champion will be a fact on April 22nd, six days before the opening game of the world championship Pool A in Germany. Appendix: HERE you can have a look at all sixteen rosters in the beginning of 2000-01 season. (26-07-00 ada) Money talks. There are many great ice hockey fans in Rosenheim. They have always loved their hockey team. They still do, even though it does not exist any more. Money talks. If your team is relegated to the second level you can still hope it will come back next year. Rosenheim had a team which was good enough to be part of DEL. But without the money, they are still excluded. There is no more hope. The history of Star Bulls Rosenheim is included in this article by Che. On New Year's Day 1928, the first game of a hockey team from the Bavarian city of Rosenheim (upon the Inn) was played. They lost 0-12 against Munich. Seemingly still in a state of shock from the result, the EV Rosenheim club languished in lower leagues until years after World War II. Since 1961, when the ice stadium of Rosenheim was built, the hockey team was able to train periodically. In 1964, the club was promoted to the 2nd division, and when the Bundesliga expanded nine years later, EVR became one of the now 11 teams of the highest league in Western Germany. Still the club was managed quite provincially and suffered from financial problems. In 1978, it seemed that Rosenheim's Bundesliga days were over. Josef Maerz, the president of the SB ("Sportbund") DJK Rosenheim, a local club then without a hockey team, prevented hockey from disappearing. In doing so, he was assisted by Guenther Zehntner, owner of a brewery and a butcher firm. Not only did they save hockey in Rosenheim, but also built up a top class squad. Some of the players they brought in included Czechoslovakians Oldrich Machac and Jiri Holik. They also recruited some famous German players of the era, such as Peter Scharf and Holger Meitinger. At the first go, however, the team only reached 7th place. In the early 1980's, DPhil Pavel Wohl became SB Rosenheim's coach. Karl Friesen was the goalkeeper; Hans Zach the captain. On March 14th in 1982, the team won its first German championship. Having only reached 5th place in the regular season, they eliminated the reigning champion SC Riessersee (from Garmisch-Partenkirchen), EV Landshut and Mannheimer ERC in the play-offs. In the following years, Rosenheim usually was on top of the table, but couldn't win the championship again until March 19th 1985, when Ernst Hoefner (who's now assistant German national coach Zach) scored the game-winning goal against Mannheim (again). After this triumph, Pavel Wohl went back to Czechoslovakia and Karl Friesen to North America (where he had the "distinction" of playing 130 minutes for the New Jersey Devils). In each of the next two seasons, SBR was eliminated in the semifinals. Even though Friesen returned from his unsuccessful NHL excursion in December 1986, it took until the spring of 1988 for the team to reach the finals again. Having beaten Cologne 2-1, they lost the next game 2-5 and cruised by a 6-0 score in the third game. On the brink of another championship, SBR players had just about popped the champagne corks. Their overconfidence cost them. Cologne turned the tables and won the last to games of the best of five series. A short time later, Josef Maerz died and some feared that the club would die as well without his leadership. Fortunately his brother, Willi, made a similar commitment to upholding the quality of the team. The club signed Dr. Jano Starsi (former CSSR national coach), Jaroslav Pouzar (twice Stanley Cup champion with Edmonton) and Gordon Sherven, who soon turned out to be one of the league's best players. After injuries to some of the squad's top performers, Dr Starsi had to put some junior players into the lineup. It hardly made a difference. SB Rosenheim was the 2nd best team during the regular season. Even with the injury depletions, they were set for a deep playoff run. They beat Eintracht Frankfurt, Mannheim and Duesseldorf to won their third championship. One year later, they ran into Duesseldorfer EG in the finals. This time DEG won. After being runner-up to Duesseldorf again in the 91-92 season, SBR left the Bundesliga because of a struggle between their sponsor group, Marox, and the city of Rosenheim. It was forced to play in a far lower league until the German Hockey Federation (DEB) annexed the club to the 2nd Bundesliga. Coach Ernst Hoefner only aimed at a position in the table's midfield; in other words, just making it to the playoffs was enough. By some "mistake", they reached the play-off finals, beat ES Weisswasser and were promoted again to the top league. The 93-94 season began with the "Beer War," in which some sponsors (rival producers of "barley juice") threatened to give up the team if the DEB carried out a plan to let the Krombacher brewery advertise its products in every Bundesliga arena. A court date was set but the dispute was settled a few month later without the team sponsorships being pulled. In 1994, the DEL was founded, becoming the top league in Germany. Rosenheim changed its name from the sterile-sounding "Sportbund" to the more menacing, animalistic "Star Bulls Rosenheim." The new name allowed them to keep the familiar SBR shorthand initials. The Bulls were eliminated in the first play-off round in both '94-95 and '95-96. The Bulls, however, became the league's surprise team of 1996-97. With new players as Chris Bartolone, Per Lundell, Scott Beattie, Jesper Duus, Pekka Tirkkonen and Jari Torkki, they became one of the top six DEL teams. Nevertheless, they were swept in 3 straight in the playoffs by Kassel. On April 13, 1997, SBR management once again announced that they would be forced to leave the league due to financial problems. Weeks later, the league membership was saved; rescued by local corporate sponsors and individual supporters. By then, most of the players had signed with other clubs. New players had to be found and a new team was formed. Manager Walter Schlosser boldly said, "We have the best team that ever stepped on the ice in Rosenheim." When 24 of the first 27 games were lost, the prediction seemed ludicrous. At the end of the season, the Star Bulls had amassed a pathetic 15 points, some 18 points fewer than the second worst team, the Revier Loewen. The next year's squad also failed to make the play-offs but it wasn't as helpless as its predecessor. Rosenheim finished in 12th place out of 14 teams. The 1999-2000 season was the last one for Rosenheim in the DEL. Finally, the financial problems of promoting hockey in small market such as Upper Bavaria won out over the fan's loyalty and hockey enthusiasm. The impending demise of the team had already been widely known during the winter, which is said to be why the team wasn't very motivated. They finished 12th. The Star Bulls sold their club license to the Hamburg Crocodiles, a 2nd Bundesliga club, which a few weeks later announced that they were unable to play in any league during the 2000-01 season. (They are now planning to take part in next season's 3rd division.) Now their former rivals Iserlohner EC will take the SBR licence. Rosenheim is bound for a far lower league than the DEL; a Bavarian league called "Bezirksliga." The last DEL game of the Star Bulls was lost 1-7 at Nuernberg on Tuesday, April 11th. The last match in Rosenheim had been played 3 days before, when the Bulls had beaten the Eisbaeren Berlin by a 6-3 count. After goals by Patrick Hucko, Gordon Sherven (2), Niklas Brännström, Jean-Francois Quintin and Curtis Fry, Quintin scored SBR's final home goal before the lights of DEL hockey in Rosenheim were turned out— forever. ...This might have been the headline for the 1999-2000 DEL season. Once again one team has folded because of financial problems. This has caused a new number of teams once again, to start the season. The franchises now number at 15. The team finishing in last place, is said to be relegated to the 2nd Bundesliga. This time hopefully all problems, and misunderstandings will be settled. Mannheim will likely not be League champions for the fourth season in a row. After the exodus of the EV Landshut, the club's limited liability company was bought by US multimillionaire Philip F. Anschutz. Anschutz is the owner of the Los Angeles Kings, London Knights of the English League and Sparta Prague and, has renamed EV Landshut to "Munich hockey club Ltd.". A cooperation with the ESC Munich, a local 3rd division team, was arranged, and a new team was founded, called "Munich Barons" This team is mostly consisting of 98-99 EV Landshut players. Less unusual this season is Moskitos Essen who have entered the DEL league. Moskitos Essen were the 1999 2nd Bundesliga champions. The franchise insisted they be promoted to the DEL League, and had received their license in midsummer. It is believed they will become the only team not expected to reach the play-offs. In the first few weeks of the season, it appeared to be a pure understatement, when the Moskitos were in the table's midfield. Teams like the Koelner Haie from Cologne, Krefeld Pinguins and the reigning champion Mannheim Adler dominated league play at that time of the season and after a few years of mediocrity the Berlin Capitals, who replaced Eisbaeren, from the eastern part of the city of being #1 of the German capital. The downfall of Eisbaeren was one of the most surprising things on ice, together with the one of Nuernberg IceTigers, 1999 championship finalists. No matter how bad they played, they always could be sure there was one team worse than them. In the first part of the season, there was the Revier Loewen Lions from Oberhausen, whose biggest success was there first road win in 21 months, But with new Swedish coach Gunnar Leidborg and Finnish goalie Sinuhe Wallinheimo, things were better, and worse. The Moskitos experimented with a roster mostly consisting of Czechs and Slovaks players in a league mainly influenced by Canadians failed. Loewen could make up a leeway of 20 points, and in the end got a lead of 16 points on Essen. So the best news about the so-called "relegation round" was that it only took five weeks. The worst news was that it was all played in vain. The Moskitos sued for their right to play in the DEL next season, because as a just founded limited liability company they would not yet have been allowed to play in the 2nd Bundesliga, where only clubs were allowed to play at that time. That had already been in the offing during the winter, so that the attendance of the relegation round games had not even been much higher if Essen had had a little chance on the ice. The pursuit of the championship got more and more suspense packed. Behind the superiority of Koeln and Munich, Krefeld reached 3rd place after the regular season that took 56 games more than ever before. They were followed by the Kassel Huskies with 12 German players and national coach Hans Zach. Mannheim and the Capitals, each had 97 points. In the quarter finals of the playoffs, only Koeln made a three game sweep against the Augsburg Panthers. Krefeld failed 1-3 in their series against the Capitals. Mannheim 2-3 against the Huskies, and Munich struggled hard over five games having beaten the Frankfurt Lions 3-2. In the semifinal, short work was made of Berlin and Kassel, so the giant Koeln and Munich could face each other in the finals. The first game, in Cologne, was won by the home team, who was still hungry for more. On Easter Monday, the Barons struck back 3 to 2, with the game winning goal by Johan Rosén. Back in Cologne, Munich scored three goals and none against because of brilliant goaltending from Boris Rousson who had been mustered out at Cologne one year before. It must of felt like revenge for that now. In the dramatic fourth and final game of the series, Koeln hit the goal post twice and the Barons won 4to3. "Munich had a well earned win. They calmly took advantage of Koelns mistakes. This is what makes champions. ", said Cologne's coach Lance Nethery afterwards. Later on, sharp tongues talked of a purchased championship, some friendlier characters of a hockey fairy tale. This can unquestionably be said, of the German appearance in the B-pool world championships in Poland, for which the DEL took a 17 days break after the semifinal. The team of Hans Zach won six games and were only beaten by Poland 6to2 with New York Islander star Mariusz Czerkawski starring for the Polish side. Germany will be promoted to the A pool. Not only as an armchair decision, but also on ice. "No matter if we reach the first or the last place here, that doesn't change anything of the situation of German hockey." Zach had already explained before the tournament, knowing that a success like this year's can't be expected every year. "Nations like Finland and Sweden have a bigger choice of goalies than we do of on ice players." His choice of on ice players became a bit larger this year, with a young forward named Thomas Greilinger, who already was in the national squad for the tournament in Katowice. Having played for the Deggendorf Flames in the 3rd division for the most part of the season, he made a few games for Munich, even in the play-off finals. He is now regarded to be one of the most talented young German players. And he's still reasonable about the NHL. "That's surely every hockey player's dream, but I don't yet think about that. At the moment, only the DEL is important to me." There he'll play for the Schwenningen Wild Wings, where he hopes to get more experience than in a so well composited squad as the Munich Barons'. The Munich Barons 1999-2000 championship team: Boris Rousson, Christian Kuenast, Jochen Lehmann; Shane Peacock, Hans Lodin, Kent Fearns, Jason Herter, Chris Luongo, Heiko Smazal, Brent Severyn, Markus Jocher; Simon Wheeldon, Peter Douris, Mike Casselman, Pelle Svensson, Johan Rosén, Bob Sweeney, Alexander Serikow, Jari Korpisalo, Joerg Handrick, Phil Huber, Wayne Hynes, Mike Kennedy, Robert Joyce, Peter Abstreiter, Thomas Greilinger, Svend Wiele, Bill McDougall.